Modo Modo Agency wins more accolades by being named to the Atlanta Business Chronicle's 2017 Top 50 Advertising & Marketing Firms and the Expertise 2017 list of Top 20 Best Atlanta Advertising Agencies. Modo Modo Agency, an Atlanta-based creative firm that has won over 200 awards, has some new accolades. Modo Modo was just named to the 2017 Top 50 Atlanta Advertising & Marketing Firms by The Atlanta Business Chronicle. This isn’t the first time they’ve been recognized by the ABC, also having been acknowledged in 2010 as a Fastest Growing Women-Owned Business and in 2014 when Founder, Moira Vetter, was honored with an inaugural Women Who Mean Business award. 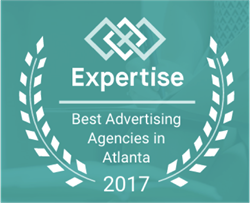 In addition, Modo Modo has made the 2017 Top 20 Atlanta Advertising Agency list by Expertise out of 143 firms. The list is evaluated based on 25 variables across 5 categories including reputation, credibility, experience, availability and professionalism. The company, which serves Fortune 500 global brands, has committed to growing the right way by doing great work, hiring great people and giving back to the community. Now in their 10th year, Modo Modo Agency DoGooders have donated over 2,500 volunteer hours and provided dozens of strategic pro bono engagements helping over 30 organizations. Among these, most recently was 48in48, a non-profit that helps create 48 websites for 48 non-profits in 48 hours. They turned to Modo Modo to capture the power of their brand story in video and evolve their identity.